Recently, a visiting Parisian made me laugh. Stretched on the grass next to the esplanade of the Old Port, she suddenly noticed Habitat 67’s retro-futuristic assemblage across the Lachine Canal. 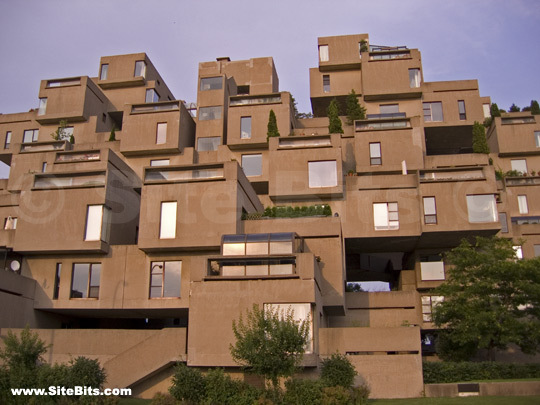 The building was designed by the Israeli architect Moshe Safdie as his master’s thesis project at McGill University (Safdie was a graduate student in Architecture ). It was built in time for the 1967 World Fair, although the original project was approximately five times larger than what actually got built. Because of that, some parts of the reduced project (notably, a shopping complex for residents) didn’t make economic sense and were never realized. My Parisian friend’s comments notwithstanding, the building has earned itself a reputation as an architectural masterpiece and is considered to be one of the most unusual residential buildings in the world. Why? Thanks mostly to its shape. 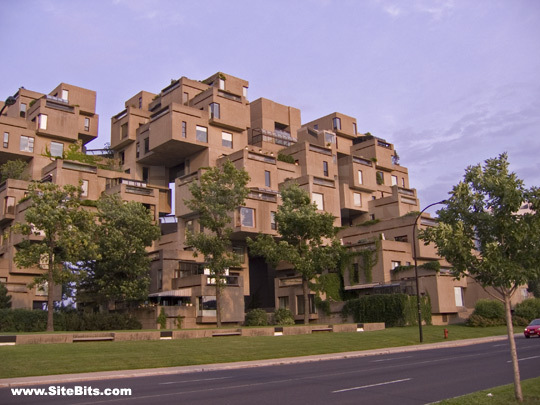 Habitat 67 is made up of 354 prefab reinforced-concrete cube modules stacked in a certain order and connected with steel cables. (Actually, despite the name, the modules are not exactly cubic, since their measurements are unequal in the three dimentions: the base of each “cube” measures 19 by 38 feet). The apartments (a total of 158 units ) come in fifteen different layouts . Most (about 60%) are made up of two boxes, some (6%) use only one, others use three, four and five. One particularly large unit is comprised of eight connected boxes. The apartments are further inter-connected with “horizontal pedestrian streets” designed to help foster the sense of community among residents. The stacking order, although it appears chaotic, is anything but: the project maximizes privacy and views for its inhabitants. Despite the intangible benefits of being part of the world’s architectural history, the Habitat’s apartments were initially fairly inexpensive. As recently as in the mid-1980s one could become an owner for a mere $50,000. Today, most units sell for over $1,000,000. Naturally, I am not suggesting you move into the building (although if you decide so do so, I’d certainly love to hear an insider’s point of view). But at the very least, the structure is worth looking at. The quick-and-dirty way to do so is simply to walk down Rue McGill in the Old Port, and observe it from directly across the Lachine Canal (the complex sits on its own peninsular, which is separated from Old Montreal by the canal). The more thorough approach would involve visiting La Cité du Havre (a 10-minute bus ride). Safdie’s thesis was called “A Case for City Living, A Study of Three Urban High Density Housing Systems for CommunityDevelopment”. Some sources mention 156 or 150.